Why Do My Water Pipes Vibrate & Make Noise? The water pipes in your home have a simple job to do. They ensure you have a supply of water, not only for drinking, but for showers, cooking, washing and other important tasks. Generally, you don't have to worry too much about your pipes, but occasionally, they may begin making noises that raise a red flag. When pipes are making strange noises or vibrating, these conditions typically are caused by one of a few factors. If you hear loud noises and feel vibration in your water pipes when you turn off a faucet, it's probably a pressure issue. 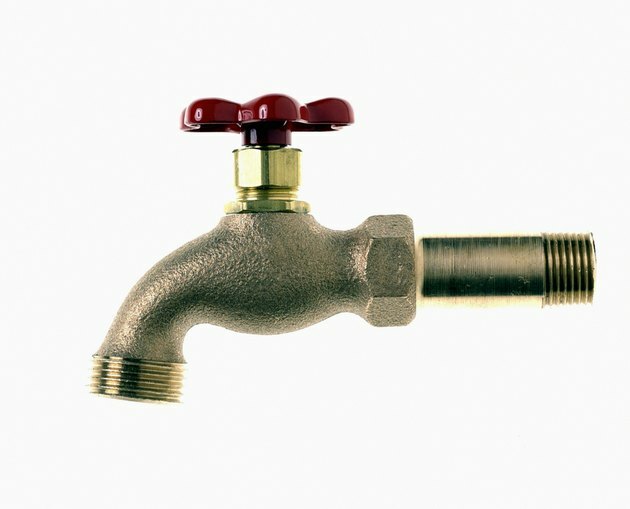 Water hammer, also known as hydraulic shock, is an immediate increase in water pressure when the speed or direction of water in pipes changes suddenly. It is most noticeable when you turn faucets off suddenly or start up or turn off appliances that use water, such as dishwashers. A valve stops the water suddenly as it is turned off, and the approaching water slams into it as it's forced to stop. If your pipes have a banging sound and vibrate when water is turned off, this is likely the issue. You can install a pressure-reducing valve to prevent these effects. Water hammer is capable of doing damage to pipes and appliances. As water moves through at varying speeds and volumes, it changes the weight of the pipes, If your pipes are not properly supported, even normal water use can cause them to vibrate or even knock against one another. Installing pipe supports will hold them in place and make them less likely to vibrate. If you hear a ticking or knocking sound coming from your pipes that sounds like someone tapping on the other side of your home's walls, you can usually assume someone is running hot water somewhere. The reason for this creepy sound is the expansion of the pipe materials, particularly if you have PVC piping. The heat from water flowing through the pipes from the water heater will cause the rhythmic ticking sound as the plastic or other material expands and causes the pipes to rub against nearby construction materials or one another. If it really bothers you, you can try lowering the temperature on your water heater to control it or consider insulating your pipes. Pipes can vibrate and sputter or spit violently, making lots of noise, if there is air trapped in them. If you have air in a pipe caused by a recent repair or another issue, you will have to deal with the shaking and sputtering pipes for a short time until the air is forced out. Just leave your faucets on until the water flow returns to normal.